I didn't notice until just now, and it may have been noticed already, but the trailer on the site now has flash-based 3D effects. The picture of Chris and Rose almost seems like a nod to 0rigins, using mirrors to view the Otherworld...holy crap, this revamped site makes me so excited for the movie. I'm glad to see they added some good stuff to the site! The site for the first Silent Hill movie was really good, but this one is neat too. I also like the 3D effects on the trailer! "It's cute, funny, cool, and gross!" Watch it and see for yourself! Did anyone notice when you click "3D" on the page with Dischead, it sounds like a female voice saying something like "you cannot defy it." Pretty cool site, I must say. I didn't even notice that, it seems the 3D button zooms in on each sub-page. Also, maybe there's some significance to there being two disc-heads? Maybe that means it's an enemy and not claudia/god/boss. The disc heads are likely the minions we see walking cloaked in the trailers, all missionaries working for Caludia. I think the two discheads on the website are just different shots of the same monster. I still believe it's Claudia. Two Diskheads on the same page may as well mean nothing, there are two Heathers on "About the Film" page for all I know . Well, that would make sense for why they're cloaked. Technically there's more than one Heather if you count Memory of Alessa. But yeah that's a good point. I'm still waiting for dat map! Me too! It looks like they've used the map from the first film as a blueprint for it too, which is nice for continuity's sake. If you look at the little preview icon for the map, it seems that the streets are almost exactly the same as the streets on this map. Wow! Never saw that image of the first film's map. 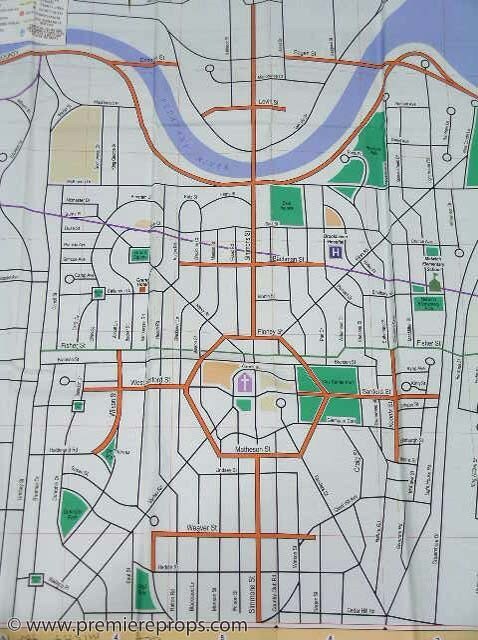 Interesting how the orange highlighted streets are the shape of the cult's symbol! It's only a week until release, and the map still hasn't been put up on the site. I really want to look at it. It appears that they directly used the map prop from the first film to build this map. Although this is awesome for continuity's sake, I wish they had extended the map down further to show the full town. One shows a man walking into the Fog World, much like Rose does in the first film. 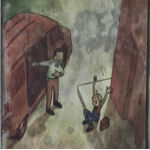 Could this be Harry, Douglas or maybe even Travis Grady? The other shows a school bus driving into Silent Hill in the real world, pursued by two police vehicles. We know that there is a burning school bus at Lakeside Amusement Park, so I'm guessing this is the same one. I wonder if this scene is in the past or present though... people have speculated about a group of teenagers ending up in Silent Hill before, I wonder if this may be something along those lines? They put the wrong picture on Christabella's profile.